With its gold-ground and tempera technique, this devotional altarpiece is an example of the international Gothic style that survived in Siena well into the fifteenth century. Noted for the richness and variety of his palette, Sano di Pietro was a successful master who ran a busy workshop in that city. He seems to have been familiar with Venetian religious painting, a certain Byzantine preciousness being part of his repertoire. A number of Sano's subjects focused on the life and works of San Bernardino, a controversial local saint the painter had known personally. It was Bernardino who conceived the device of the Holy Name in the Sun, an emblem in which twelve solar rays represented twelve articles of faith promulgated by the Apostles. For this doctrinal innovation he was charged with heresy. 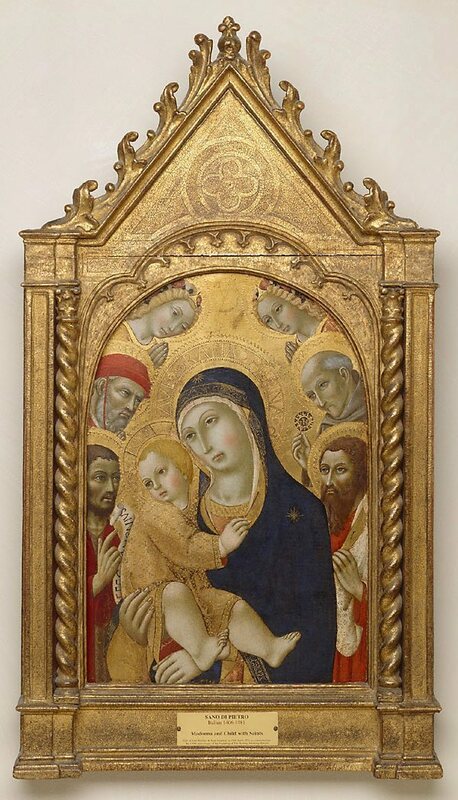 In this panel, Bernardino's participation is restricted to that of an auxiliary figure. 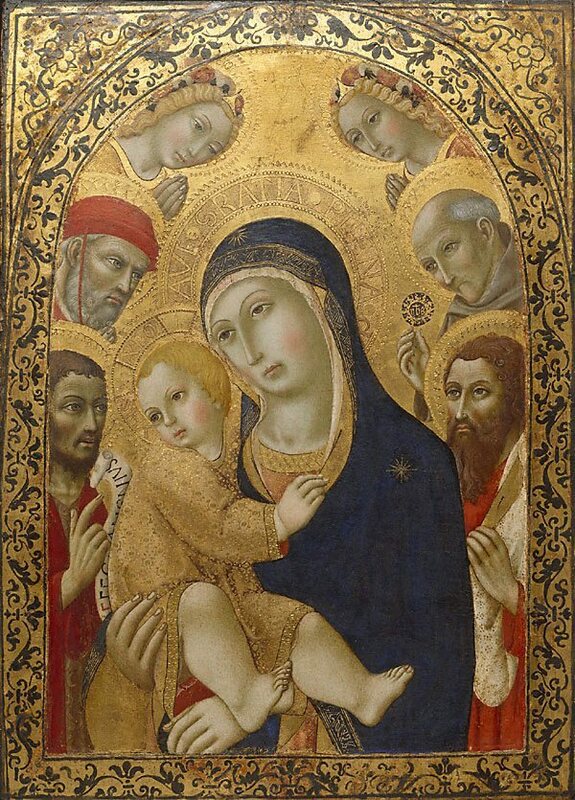 Appropriately, it is the blue-mantled Virgin and her delightful infant who hold our attention. Donald Brook, The Sydney Morning Herald , 'The Unmomentous Old Masters', Sydney, 08 Oct 1970. Renée Free, Art Gallery of New South Wales handbook , 'European', pg. 36-56, Sydney, 1988, 37 (colour illus.). Bruce James, Art Gallery of New South Wales handbook , 'Western Collection: Paintings and Sculpture', pg. 17-77, Sydney, 1999, 18 (colour illus.). The World of San Bernardino , London, 1963. Siennese quattrocento painting , London, 1947. The many faces of Christ , Sydney, 2000, 36 (colour illus. ).